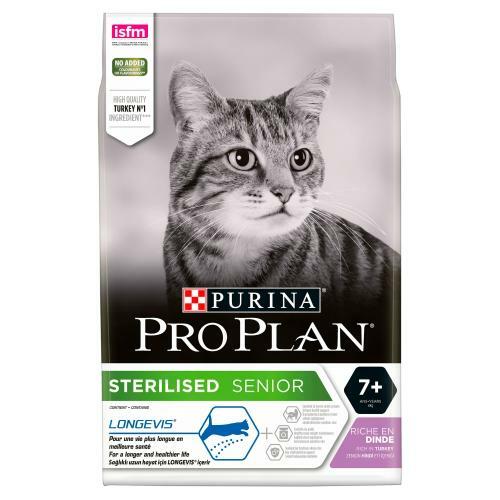 The PRO PLAN Sterilised Turkey Senior Dry Cat Food is a delicious turkey kibble that contains all the nutrients needed to support long-term health in senior cats. What's more, the recipe is low in fat to help maintain a healthy weight and includes a nutrient blend proven to extend healthy lifespan. The formula has been expertly balanced to help sterilised cats stay in healthy condition throughout their mature years. The protein, fat and carbohydrate levels have been specially adapted to help maintain ideal body weight in sterilised cats.